P.8 ~ from this Warp Warp emergency report Kenji Iino says "D2"
The intro takes place in Transylvania and tells the story of a count with no heir. He sacrifices people to the gods (all the people on the pikes) in an effort to conceive an heir but the only result is his wife dies. He turns to magic and strikes a deal with a demon for a son in return for his soul. The demon steals Lauras child from her womb and transports him to the count. 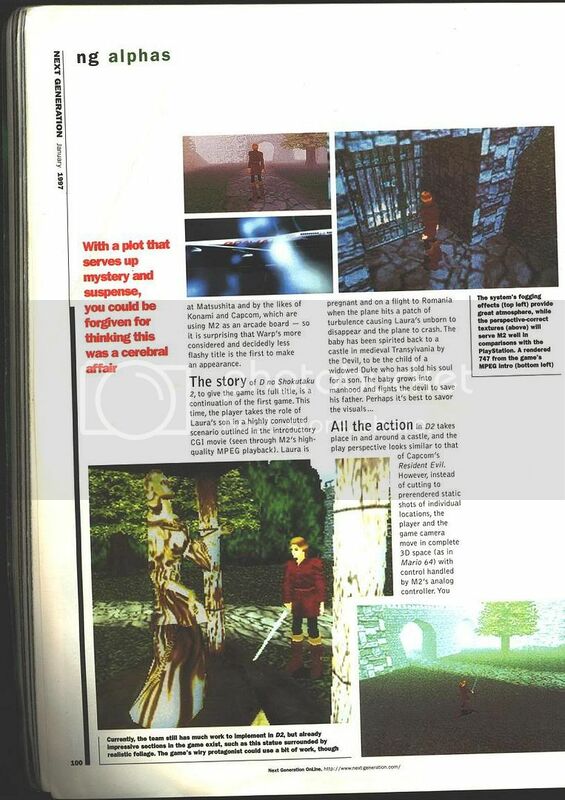 The 10 minute video came from a Japanese 3DO demo disc, and there's a lot of other magazine scans. For a little while this was the only M2 game publicly shown, had to put some pictures in with the articles trying to sell it. There was even ads running for it in Japanese magazines. 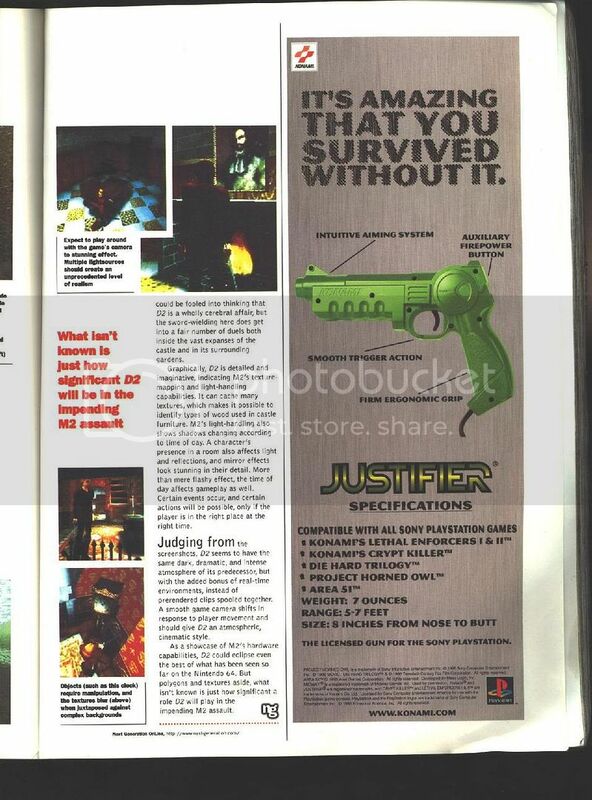 All the magazines you just listed about though are referring to the Dreamcast version of D2. I have pictures that aren't on Unseen64 too but i need to go through them and organise them, all my D related stuff is strewn across bunches of folders, i've been lazy in getting them into some order. From the extra screenshots, I am getting the distinct sense that only three areas of the game were actually playable. 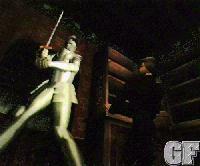 It seems like every media source shows either A) the interior of a house/castle, at or near a fireplace (shown in the beta movie as well) b) the outside courtyard with statue (also shown in beta video) and C) what I am calling the "red vertical tower" that appears in the 40 second next gen mag video, as well as these screenshots. 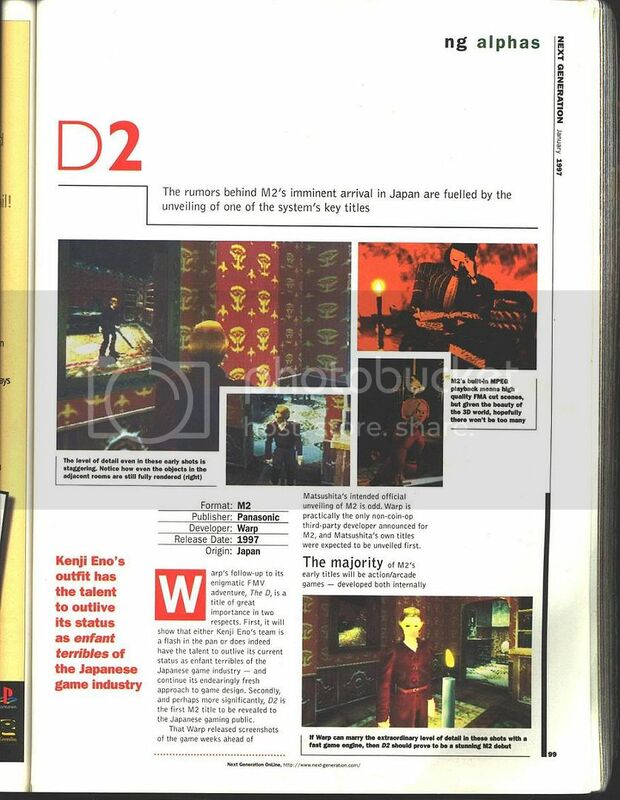 So it begs the question...was Laura involved in the storyline of D2 for M2, outside of dying on the plane? The picture above that render in the image dump post i made is Laura too (wearing the same outfit if you look close) with the demon presence, so she probably was. Remember the whole plot of D was that Laura was a blood descendant of Dracula so technically her son would be a blood relative of the counts (if the count is Dracula, which he probably is), which is probably why he was chosen. Maybe being part drac meant Laura could die but then be undead so she'd survive the crash, maybe if the count is Dracula it meant the demon couldn't claim his soul and set to work against him by going to Laura before she even fell pregnant. Many possibilities, shame we'll probably never know. 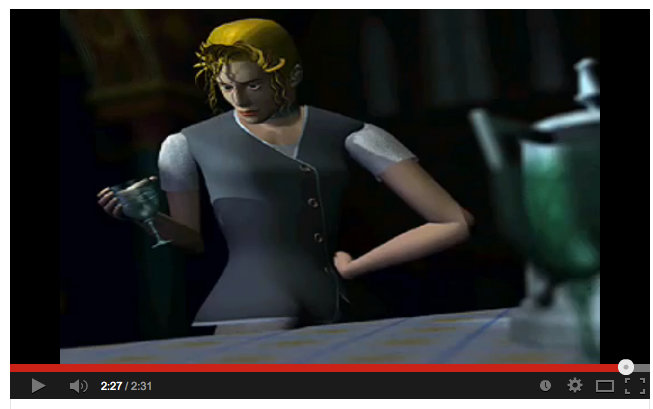 It might be worth pointing out that although the Laura in the Dreamcasts D2 is a different Laura, there are hints that at one point they were meant to be the same so maybe the logic of her surviving a plane crash crossed over. I'd tend to agree. Considering Laura survived the plane crash in the Dreamcast version, it's certainly plausible she did in the M2 version as well. How she got back in time? deLorean I'm sure! 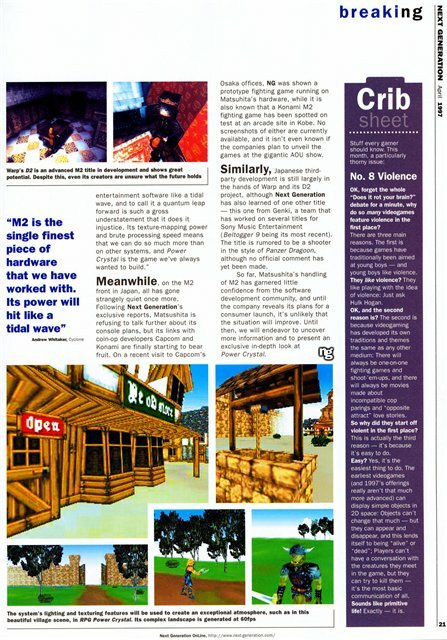 In regards to how far the game progressed before being cancelled : "When I found out about this new hardware called M2 - it was very powerful - I was thinking that I would finally have a chance to make a complete real-time 3D action game, an action game that has the characters battle with swords. So I was about 50 percent finished with development - my programmer had completed the battle engine, and I was expanding the maps and all that - and then the hardware got cancelled." That development was cancelled once to restart the entire game : "D2 will be released on the M2, not on other platforms. Maybe on PC, but no other consoles. 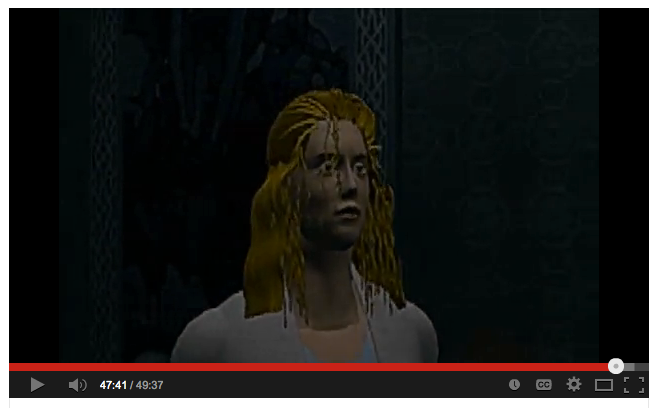 It's basically all real-time polygons. To tell you the truth, however, we decided to start from scratch last month. The M2 specs will be better than the current one, so this was our last chance to change things. Also, if we continued developing what we were working on, by the time we were done the game wouldn't be current for today. 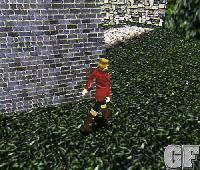 We didn't want to release something like Resident Evil or Alone in the Dark. We wanted to release a real-time polygon adventure game that felt like the old PC game, Into the Sudden Shadow"
and the plot synopsis, from GameFan and Eno : "Basically, the story begins about a year after D. Laura's on a plane somewhere and she's pregnant... Hmm... Actually, the story starts before this, during the Middle Ages. There was a feudal lord in Transylvania who desperately wanted a child to take over his country. He believed in the local superstitions that said that you could have child by sacrificing people by impaling them on stakes. The local people began to call him the Impaler King. Of course this was nothing but superstition, and he had no child. When his wife died, he became so desperate that he learned black magic and summoned the devil. He begged the devil to give him a child, that he would sacrifice his own life for one. The devil agreed and left Transylvania. The scene will change to the one I was telling you about before, the plane in 1997. The devil appears, surrounds the plane, and tries to crash it. Then he kidnaps Laura's baby. You can tell the baby disappears, because Laura's stomach becomes hollow. I think Laura dies in the plane too... The scene changes back to the Middle Ages and the crying of the baby fades in... That's the opening story. 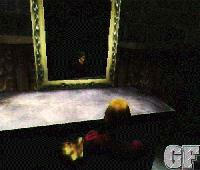 The main character of the game is Laura's child. When the child grows up, the devil returns to Transylvania to come calling for the Impaler King's life, and destroys the castle. The child then takes off for the adventure to kill the devil." 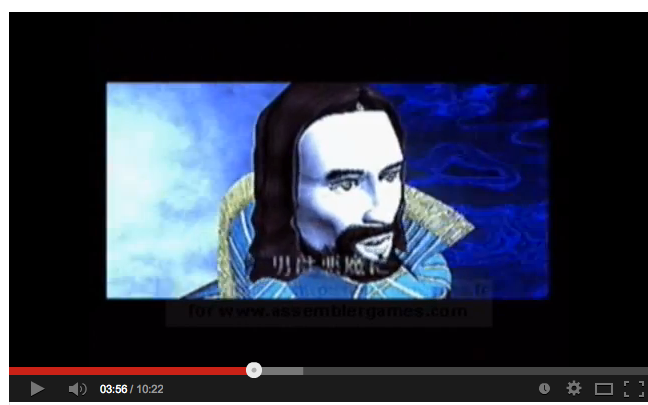 By the way the old egomanical srewball has uploaded some old - but interesting D2 movies (naturally pure random!). he's active at least under one pseudonym over at assembler. Some collectors are really a very strange clique. The years pass, but the guys never change. My guess is the footage is sourced from a VHS, perhaps sent to magazines? I doubt someone has actual playable code, i think even Eno mentioned somewhere that the code was probably lost. I love the 3DO, and I really wish that the M2 had been released and been successful!